Shift the flour, sugar, baking powder, baking soda and salt together in a bowl. Mix until combined. In another bowl, whisk together the egg, milk, vanilla, wine and oil. Pour the liquid mixture into the dry ingredients and stir just until combined. You should still see traces of the flour. Scoop the mixture into the prepared muffin pan/cups, about 2/3 full, and bake until a toothpick inserted into the center of a muffin come out clean, about 20 to 25 minutes. For the frosting start by mixing the butter with the white fondant. When the mixture becomes creamy add the salt, lemon juice, lemon zest and wine then start beating again until you get a thick consistent mixture. If the mixture is too thick, add a few more drops of wine. 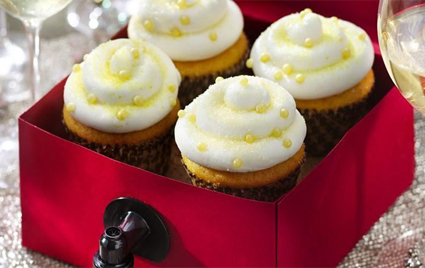 Frost cupcakes then sprinkle with yellow sugar and pearls.